With display switched so that the upper line shows the number in the memory. Close up of the display, switched to show the items of a calculation, here 22/7. 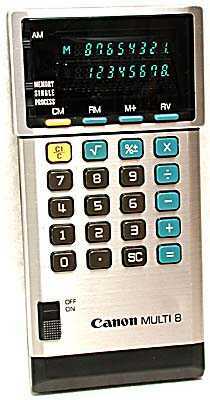 Distinctive features: The first hand-held calculator with a multi-line display. Display has 2 lines, each of 8 digits, blue fluorescent. Integrated circuit - Texas Instruments TMS1079NL, here date coded late 1977. 76 x 154 x 22 mm (3.0" x 6.0" x 0.85"). The upper line displays the number in the memory (see above, left). The upper line is turned off, so giving a conventional single line display. Both lines display the items of a calculation (see above right). 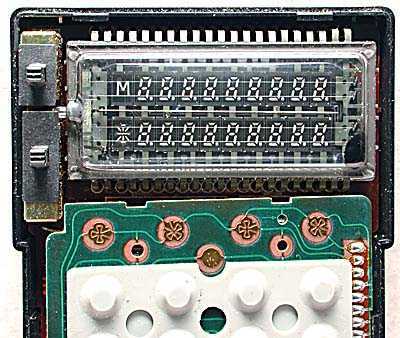 Close up of the 2-line fluorescent display. 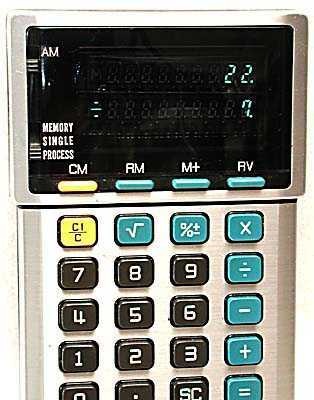 Until the introduction of cheap multi-line LCDs (Liquid Crsystal Displays) in the 1980s this was one of the very few calculators to display more than one line.